NIA-CHARLESTOWN NEVIS (June 09, 2011) — The geothermal energy resource on Nevis belongs to the island’s people and not any political party on the island. 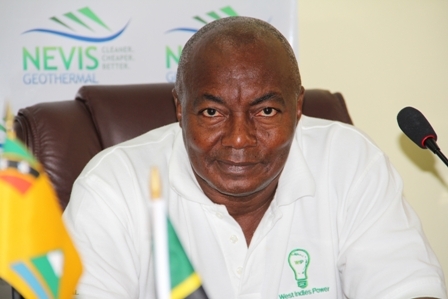 That sound message of geothermal ownership is one of many which the Nevis Island Administration (NIA) hopes to deliver to the people of Nevis, through a week long public awareness campaign themed “My Nevis My Energy” and “Nevis Geothermal Cleaner Cheaper Better”. The event was launched on Wednesday with a press conference hosted by Minister responsible for Natural Resources and Renewable Energy on Nevis Hon. Carlisle Powell at the Ministry of Finance Conference Room in Charlestown. He was accompanied by his Permanent Secretary Mr. Ernie Stapleton, General Manager of the Nevis Electricity Company Ltd Mr. Cartwright Farrell and General Manager of geothermal developers West Indies Power Ltd. Mr. Rawlinson Isaac. 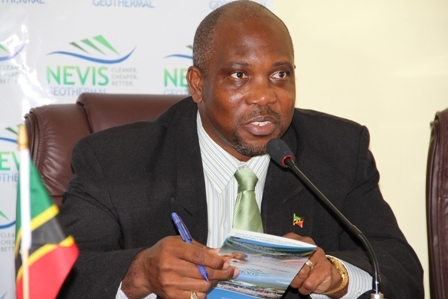 Minister Powell explained that the drive was a new thrust to educate the people of Nevis on geothermal energy and the benefits it would bring to the island through the use of brochures, mounted billboards, bumper stickers, school visits, radio, television and local newspaper programmes among other public activities. “We will also be distributing the t-shirts so that people can wear and advertise the message that geothermal energy is not energy for the Concerned Citizens Movement or the Nevis Reformation Party. Geothermal energy is energy available in my Nevis, it is my energy, it is cleaner it is cheaper and it is better. “We are asking the entire population to buy into the idea of geothermal. We are also asking people to understand that in the Philippines, Indonesia, Kenya and others [countries], that geothermal energy does not cause hardships for the people. Instead because it produces a cheaper base load power it is extremely beneficial for the people of those countries. That is why we are engaging in this massive public relations campaign, so that the people of the country can buy into the fact that geothermal energy is good for all of us, whatever your [political] persuasion,” he said. Notwithstanding, Mr. Powell stressed that the campaign was non-political and therefore the logo used for the campaign was deliberately designed with the existing realities in Nevis in mind. “We took a very deliberate decision that the logo could not be all green even though geothermal energy is green renewable energy, even though my party’s colour is green. “Our position was that the logo must reflect the realities in Nevis and the realities are that there are two political parties and that their colours are blue and green and we want it bought by every single person and so we designed the logo which is blue and green,” he explained. 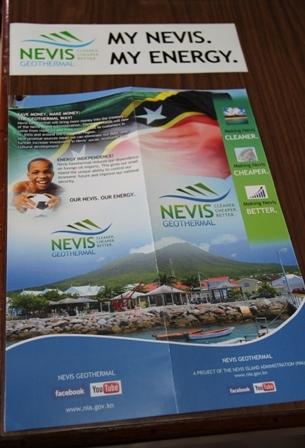 The logo depicts the Nevis peak with three streaks of green and a streak of blue which denotes the sea waters surrounding the island. The other markings are also of the same colours on a plain white backdrop. Mr. Powell further noted that a pickup truck donated by West Indies Power Ltd. had already been designed and painted with the logo “Nevis Geothermal cleaner, greener cheaper better”. The vehicle will be used throughout the island to spread the message of geothermal which was not a dream but a reality for Nevis. Meantime, General Manager of West Indies Power Ltd. Mr. Rawlinson Isaac expressed his satisfaction with the awareness campaign as he welcomed the opportunity for his company to be a part of the campaign. He said the company had worked together with the NIA for the last four years of the development of geothermal energy and it was available to lend both financial and other types of support to the Government in its awareness campaign. According to the programme line up on Thursday June 9th on Choice FM a segment on the Tell Me Show will be allocated to the campaign; on Friday the geothermal advertising truck will travel throughout the island and later in the day there will be a block party at the D R Walwyn Square in Charlestown with music, food and drinks. There will be giveaways and promotional material will be available for the public. On Saturday there will be an island wide motorcade and on Sunday there will be prayers of thanksgiving in churches across the island. On Whit Monday there will be a Geothermal J’ouvert Troupe depicting the geothermal message. The week of activities will conclude with a panel discussion on geothermal.